Johan Marcus, the SACC-USA President and Executive Director visited Texas during a four day long road-trip in December. Our very own SACC-Texas President, Hans Cederlund located in Houston joined Johan on his tour. The aim was for us in SACC-Texas to show and promote what a great business climate Texas has. The Texas tour started in Dallas one cold December day where we met for lunch in Plano with Jonas Jacobsen COO at Aptilo Networks to hear Jonas share the story on why they choose Dallas to establish their North America HQ´s in. The tour continued to Dallas Regional Chamber (DRC) in Downtown where Sarah Carabias-Rush, Vice President of International Economic Development and Melissa Maguire, Manager of International Economic Development could share information about the Dallas Fort Worth area and why so many companies choose to relocate to Dallas/Texas from other States around the country. How many new jobs that are created here each year and other exciting facts about Texas and Dallas. At DRC Johan was also introduced to Kenton Kisler – President and founder of Executive Connection which is a member organization for VP and C-level Executives at some of the world’s most recognizable companies. From that Johan was taken to Ericsson North America HQ in Plano where he met Barbara Baffer Vice President, Marketing Operations, Internal Communications & Government Relations Ericsson. Johan got to introduce the SACC -USA network, the vision and mission to Ericsson and the Dallas Board. It was finalized with an exciting glimpse of the future within 5G and IOT at the Customer Experience Center at Ericsson. 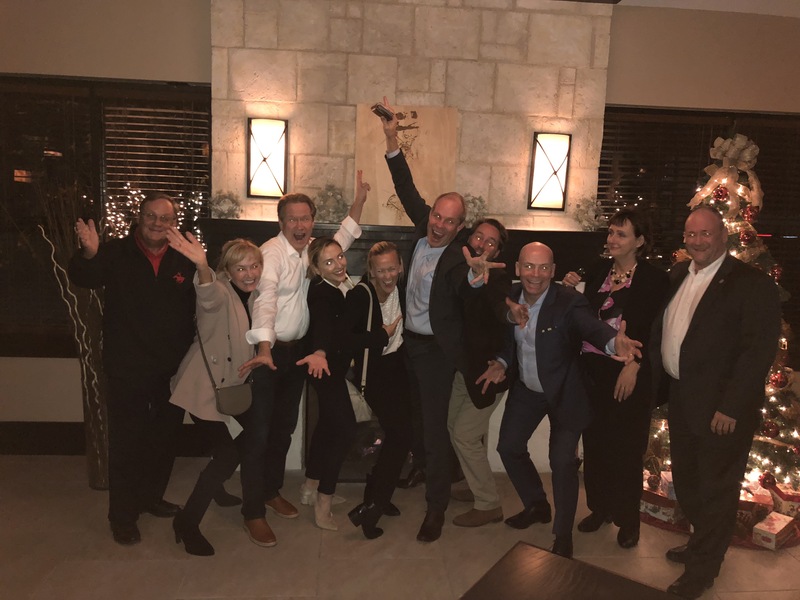 The whole Dallas chapter Board as well as our Swedish Honorary Consul in Dallas, Tina Klintmalm met for a concluding dinner at Estilo Gaucho a Brazilian steakhouse. For the Austin part of the Texas tour, Johan was introduced to Boundless Network, a promotional products distribution company founded by SACC-Austin president, Henrik Johansson. Boundless also serve as a host company for SACC interns and trainees. At Boundless Johan learned everything about creating Brand Love moments, before continuing on to the University of Texas where, Björn Engquist, greeted him with great enthusiasm. Björn has a Ph.D. in numerical analysis, holds the Computational and Applied Mathematics Chair I, and is director of the ICES Center for Numerical Analysis in Austin. Björn was introduced to SACC-USA’s Tech Talent to Sweden-project and offered his help to forward the initiative. Next up was a visit to WeWork where new Austin board member, Anders Stenkvist, told Johan more about the process of starting up Ericsson’s ASIC Design Center in Austin. Then finally, and in true Swedish spirit, Johan had spiced wine and gingerbread cookies with the amazing team at Scandinavian Spaces, who contract furniture, interior solutions, and represent an exclusive collection of Swedish brands, before ending the day with a low key dinner at the Native Hostel Bar & Kitchen with the entire Austin board. The final days of the Texas tour was spent touring Houston where Johan and Hans started with a tour of the Port of Houston/ Ship Channel Economical Alliance. There was a Christmas lunch at Northwinds Construct. Johan also got to tour the Greater Houston Partnership, an organization that attracts community-minded business leaders who want to be involved in Houston’s positive growth and influence the direction in which Houston is going. Also seen was the Medical center, Rice, University of Houston and Downtown. Johan and Hans also met with Honorary Consul General of Sweden, Astrid Marklund. The Texas visit ended with the SACC- Houston Christmas Party. We think it safe to say that Johan Marcus went back to Washington DC and SACC-USA with many great impressions and a very positive picture of Texas and what we can offer here. SACC-Texas is excited about the year ahead with SACC Summit being hosted in Houston this coming October.